Butterfly Baby Place: The Garden is Growing! Our garden has grown SO much since the last time I posted about it. 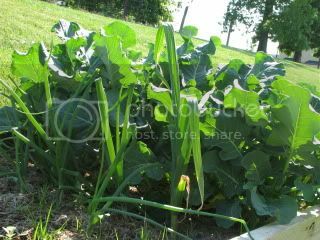 We have been eating spinach and swiss chard like it's going out of style and our broccoli crowns are finally growing! It's so exciting to see something you planted producing something. 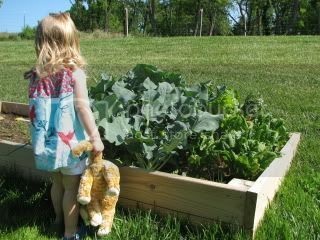 By no means do I consider myself a green thumb, but this stuff is actually pretty easy! What's better? We're going to get some tomatoes and herbs tonight to plant. It's almost as big as her!!!! I did spend about 30 minutes today picking out grass that grew in there over the weekend, but it's pretty low maintenance. Plus, Ava helped! BROCCOLI!!!! Look at the itty bitty baby one! I am making swiss chard enchiladas later this week! I'll post the result and pics when I've had the taste test! 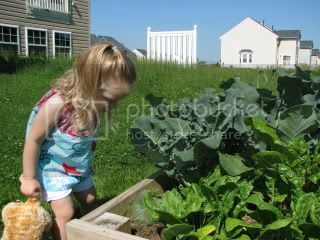 Forget the garden look how long Miss Ava's hair is! But really WTG on the garden - it looks great! I know, her hair is SO long!!! I love it with the little curl at the end. Looks great, Jess! You might consider beans, too. They freeze really well. We ate last year's garden beans until January this year, it was awesome! Oh GOOD! 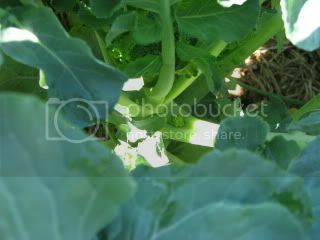 There is hope for our broccoli! :) We just got some & it's looking so, so sad. Ooh beans, what a good idea! Joan, there is totally hope! 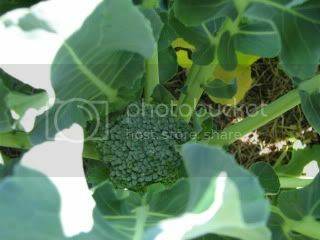 This was our first year buying broccoli and we'll probably be harvesting our first crop by this weekend. With all of the rain we got this weekend, it doubled in size! !